About two-thirds of Carrington House’s 60 residents have dementia, many are lonely and some do not get any visitors. At the end of their training the 25 students (aged 16-18) were given ‘YOPEY Befriender’ badges Mr Gearing, who was made an MBE by the Queen in 2017 “for services to young people in the UK”. YOPEY, which is based in Suffolk, is short for Young People of the Year. Tony, a former national newspaper journalist, has previously run Young People of the Year campaigns in Bedfordshire and other counties. The charity now focuses on YOPEY Dementia Befriender and is running a dozen schemes across the country but most are in the East of England which Tony wants to make a ‘Beacon for Befriending’. This is the first YOPEY Dementia Befriender scheme in Bedfordshire, but Tony hopes there will be more. The young volunteers write reports about their visits on the web app yopeybefriender.org where the public can see leaderboards of the top YOPEY Dementia Befrienders in the country. Callum Betley, 16, of Hockliffe Road, wrote: “We played song bingo with the residents and then we sang songs and were dancing with the residents. Director of Sixth Form, Sean Downey, explained that the students were very moved by Tony’s presentation on dementia during a recent visit to the school. “This spurred a huge response from the sixth form students who were keen to become part of this programme. “Achieving excellent academic results is clearly an important aim of sixth-form life at Vandyke but we want our students to benefit from a wide range of life experiences that will support them in growing into rounded young people, ready to take their place in society. Ms Roberts took over running Carrington House last year after the the Care Quality Commission found it required improvement. YOPEY Dementia Befrienders have contributed to another care home being rated outstanding by the CQC. 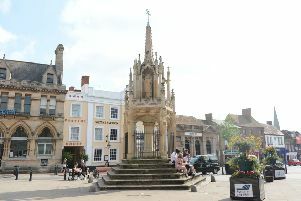 The Leighton Buzzard scheme is supported by a grant from Bedfordshire Police Partnership and sponsorship from international recruitment company Guidant. Carrington House is owned by Holdcare Limited. It is hoped the owner will contribute to the scheme continuing after the grant runs out. YOPEY Dementia Befriender is also taking part in the Bags of Help competition in Tesco stores in south Beds until the end of February and will win £4,000 it if receives the most votes from shoppers.